Selling Real Estate for over 35 years. 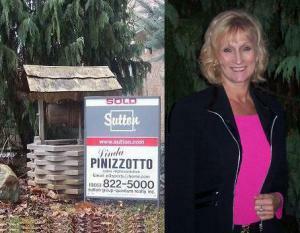 Linda Pinizzotto and her Team specializes in Toronto and Mississauga to the Niagara Region. Servicing Toronto, Mississauga, Oakville, Burlington, Milton, Brampton and the Hamilton, Stoney Creek, Dunnville areas specializing in: Freehold Detach and Executive Homes, Semi-Detached and Townhomes, Condominiums Apartments and Townhomes plus Lakefront, Beach properties, Land, Acreage, Farms and Industrial and Commercial properties. We know the value of hard work, commitment and dedication to your real estate needs. Linda consisistenly in Top 1% Nationally. Linda is one of Sutton Group Canada’s Top Producing sales agents having won numerous Awards of Distinction. [lindasigning] She is an industry leader having established a reputation for hard work and a strong determination to do the absolute best for her clients, family and friends. “It’s all about the negotiations and making sure that my clients have the best results when they buy or sell”. Linda facilitates an efficient professional marketing plan geared for prompt successful results through an effective city and provide wide campaigns. Out of Country Clients and Referral Program. Linda has an established corporate relocation and referral program working with clients from all around the world whether they are purchasing for their own needs or for investment. Making an Important Decision for Home Ownership. Home Ownership is an extremely important decision. Whether you are a Buyer or Seller, downsizing, upgrading or relocating, Linda can help you get the best possible price in the least amount of time for your sale and the lowest possible price with the exact closing date you require on your purchase. Linda Pinizzotto is your Realtor. She is the mother of 3 boys and an avid hockey enthusiast considering her sons all play/played professionally. Linda Volunteers to Help. Linda has been a leader and strong supporter of volunteerism in the community and consistently supports many charity’s and non profit associations including but not limited to Sick Kids Hospital, Children Miracle Network, Run for Life, Red Cross, Cancer Society, Princess Margaret Hospital and the Heart and Stroke Foundation. She never hesitates to offer a helping hand because she loves people. She initiated a sponsored a Run/Walk with the Running Room in support of a burn victim, she personally sponsored and hosted the P3 Sports Blue Chip Showcases, listed in the NHL Master Schedule to help draft eligible hockey players into the OHL, she has coached and managed for decades dozens of children sports teams. She is the Past Chair of Celebrations of Youth, a non profit association sponsoring Youth Day where 14-21 year olds can showcase their talents once a year at Dundas Square. Linda was a Director and 2nd Vice President of the Mississauga Real Estate Board and Chair of Government Relations and Political Action Committee for over 7 years. Linda is the Founder of the Condo Owners Association (COA). Linda is the Founder, President and CEO of the Condo Owners Association, www.COAontario.com. In March 2010, she recognized the need for a Province wide association to represent and protect the “rights” of Condo [COA logo blue backing] Owners and make important necessary changes to the Condo Act and a number of other reforms. Today, Linda has succeeded in capturing the attention needed to make COA a household name and to work with our Provincial government as a stakeholder in the McGuinty Government decision to “Building a Better Condo Act“.